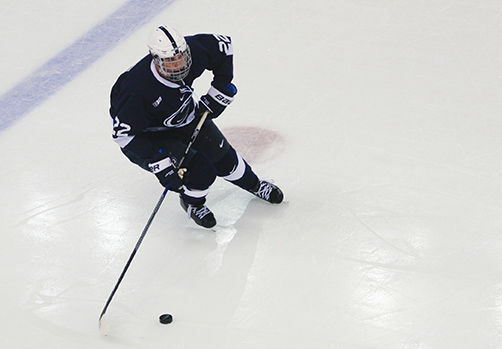 Penn State forward David Goodwin (9), the 22-year-old sophomore left wing from Des Peres, Missouri, who scored a late game-tying goal with the Nittany Lions’ net empty against the visiting UConn Huskies at the Pegula Ice Arena in State College, Pennsylvania, one week earlier, battles for control of the puck after a faceoff with Alaska – Anchorage Seawolves center Matt Anholt (17) during the opening game of this season’s Brice Alaska Goal Rush being held at the Carlson Center in Fairbanks, Alaska. Despite being held in check throughout much of this contest witnessed by several thousands fans disguised as empty seats, the “home” side were able to strike back for two vital goals inside the final six minutes of regulation play — including a dramtic, game-tying tally with the goaltender on the bench in lieu of a sixth attacker — as the Alaska – Anchorage Seawolves rallied to tie the Penn State Nittany Lions 3-3 in the opening match of the 2014 Brice Alaska Goal Rush tournment. The Nittany Lions absolutely domintated while outshooting the Seawolves 14-4 in the first period. The visitors from the East Coast jumped out to an early lead roughly four and a half minutes in after Canadian legionnaire Curtis Loik made a fine solo rush down the left wing side after initially gaining possession of the puck well behind his own blue line. A sharp-angle shot from the left faceoff circle conspired to beat Alaska – Anchorage sophomore netminder Michael Matyas and provided the 21-year-old junior from West Vancouver, British Columbia, his first goal of this 2014/15 NCAA campaign and his thirteenth career strike sporting the colors on behalf of Penn State. Alaska native Casey Bailey restored Penn State’s two-goal lead late in the second period on the power play with a long-range wrist shot from the left point. Bailey’s second strike in as many games — his 25th career goal for the Nittany Lions — looked for a moment as if it might be enough for this extremely defensive-oriented affair at the Carlson Center in Fairbanks. But the Seawolves defense would reorganize themselves to completely strangle the life out of the Nittany Lions’ attack in the final frame and ultimately set the table for what was to eventually transpire. A two-minute slashing minor to native Englishman Scott Conway, the somewhat highly touted 19-year-old freshman who helped the Indiana Ice capture the Clark Cup (the United States Hockey League title) last season, allowed Alaska – Anchorage to halve the deficit to one after Canadian legionnaire Blake Leask, the 22-year-old junior defenseman from Beaumont, Alberta, who did not appear at the Kendall Hockey Classic last weekend, struck on the power play from the point with less than six minutes remaining in the contest. The Seawolves withdrew their goaltender Matyas in the closing stages and this always-risky tactic paid almost immediate dividends when Canadian legionnaire Austin Coldwell, the 24-year-old senior from Vancouver, Washington, whose six tallies accounted for exactly half of all goals scored by Alaska – Anchorage blueliners last season, connected on his long-range effort. Penn State Nittany Lions defenseman David Thompson (22) was carried off on a stretcher late in the overtime session with the Alaska – Anchorage Seawolves at the Carlson Center in Fairbanks. The 22-year-old homegrown sophomore from Glens Mills was taken to a local hospital and stitched back together after suffering a serious stomach laceration. Thompson, who proved to be a real pleasant surprise while appearing in the second-most games played by any Penn State rearguard last season, is expected to make a speedy recovery but, of course, will be unavailable when head coach Guy Gadowsky’s long-distance travelers face off against the tournament host, the University of Alaska – Fairbanks Nanooks, on Saturday night. 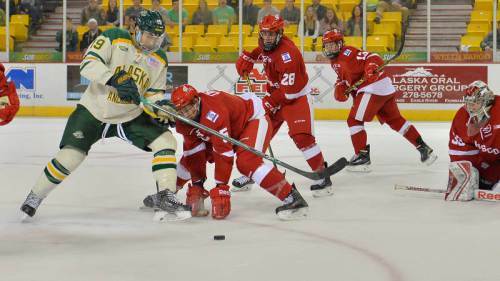 The University of Alaska – Anchorage started this 2014/15 NCAA season off in successful fashion by posting a pair of victories over the Maine Black Bears and the Wisconsin Badgers last weekend at the Kendall Hockey Classic tournament that the school hosts annually. The Seawolves, who finished last season with the winning record of 18 wins against 16 losses with four ties while competing in the newly-aligned Western Collegiate Hockey Association, deployed the exact same eighteen skaters in both games but will be forced to make at least one change to the line-up. This because Canadian legionnaire and team captain Brett Cameron, the senior right wing from Spruce Grove, Alberta, who had an an assist in each of Alaska – Anchorage’s two games at the Kendall Hockey Classic, has now been suspended after drawing a game misconduct penalty for a hit to the head of a Badgers player in the third period of the Wisconsin contest. Cameron was skating on Alaska – Anchorage’s all-Canadian first line with left wing Scott Allen, the 24-year-old senior from Edmonton, Alberta, as well as Blake Tatchell, the 23-year-old center from North Battlefield, Saskatchewan. As a sophomore last season, Tatchell led the Seawolves with 25 assists while Allen, who had a goal in each game of UAA’s games at the Kendall Hockey Classic last weekend, was the second-leading marksman amongst the troops at the disposal of head coach Matt Thomas having notched 17 goals in 33 NCAA contests. Aside from Allen, the only other Alaska – Anchorage player who exceeded 10 or more goals last term was, in fact, the captain Cameron. Alaska-Anchorage’s leading scorer last term, 23-year-old Canadian center Matt Bailey (38 ga, 20 go, 38 pts), exhausted his eligibility and is now skating in the American Hockey League with the Norfolk Admirals. One player who could be moved up to the first line is right wing Bradley Duwe, the 22-year-old homegrown sophomore form Soldatna who scored seven goals in 27 games as a freshman for the Seawolves last season. Another possibility is Canadian legionnaire Dylan Hubbs, the 21-year-old sophomore forward from Beaumont, Alberta, who led all Alaska – Anchorage freshmen with 10 points in 35 games last term. 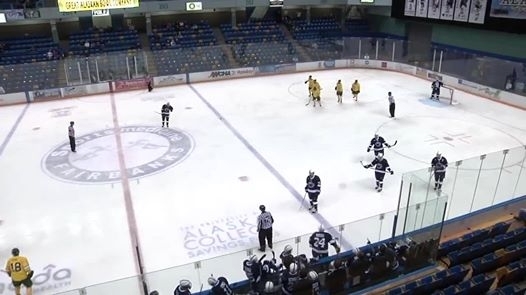 Cameron’s replacement might even be incoming freshman Austin Azurdia, the 21-year-old forward from Wenatchee, Washington, who scored a goal on his collegiate debut against the University of Maine. Outside of the Seawolves number one trio of Allen-Tatchell-Cameron, the rest of the players comprising Alaska – Anchorage’s other three forward lines are all sophomores or freshmen. Alaska – Anchorage have a fairly well experienced defenisve corps which featured a six-man unit consisting of two 24-year-olds, two 23-year-olds and a 22-year-old in opening this season at the Kendall Hockey Classic. The best of the bunch might be Austin Coldwell, the senior from Vancouver, Washington, who led all Seawolves blueliners with both six goals and 19 points last season. The most promising of this crew is probably Chase van Allen, the homegrown sophomore from Anchorage who had eight assists in 30 games as a freshman last term. Another reliable rearguard for Alaska – Anchorage is Derek Docken, the senior from Richfield, Minnesota, who has already skated in 107 NCAA contests to date. 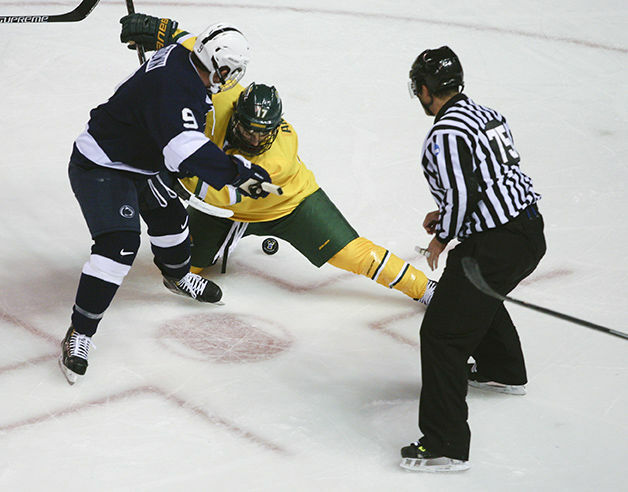 The heaviest defenseman that the Seawolves have listed on their roster is Chris Williams (6’2″ 220 lbs), the junior from North Coventry, Pennsylvania, who has accumulated six assists and 64 penalty minutes in 67 career NCAA games to date. The youngest of the UAA blueliners to appear in both games at the Kendall Hockey Classic was Canadian legionnaire Jarrett Brown, the 20-year-old from Beaumont, Alberta. Alaska – Anchorage come into this 2014/15 NCAA campaign very short on collegiate game expereince at the all-important goaltender position between the pipes. At the conclusion of last season, the Seawolves bid adieu to a pair of capable netminders who had combined to appear in 35 of UAA’s 38 games. This means that the only returning shot-stopper is Canadian legionnaire Michael Matyas, the 23-year-old sophomore from Calgary, Alberta, who appeared in seven games (3.29 avg, .877 svpct) last term. Both Matyas as well as incoming freshman Olivier Mantha, the 21-year-old from La Tuque, Quebec, performed admirably at the Kendall Hockey Classic just this past weekend. The former limited the Maine Black Bears to a solitary goal while making eighteen saves on behalf of the Seawolves in the season-opener. The latter, meanwhile, was a major factor in Alaska – Anchorage’s triumph over Wisconsin with 27 saves … (it shall be noted here that the Badgers outshot the Seawolves 29-25).